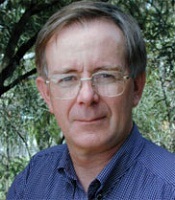 Dr Jeremy Burdon obtained his BSc and PhD from the Australian National University, Canberra, ACT, Australia and joined CSIRO as a Queen Elizabeth II Fellow in 1978 rising to the position of Chief of the CSIRO Division of Plant Industry. He was a Fulbright Scholar and EC Stakman Visiting Professor at the USDA Cereal Rust Laboratory in Minnesota, United States of America and a Visiting Professor in the Department of Ecological Botany at the UmeÃ¥ University, Sweden. using fungi as biological control agents for controlling invasive weeds. His research, underpinned by authorship of a landmark monograph, has involved a multidisciplinary approach that has drawn on pathology, ecology and genetics to generate a better understanding of the effect of pathogens in plant communities. Combining empirical and theoretical approaches, he has made key contributions to understanding the complexities of gene-for-gene co-evolution in plants and pathogens, spatial and temporal patterns in disease resistance and virulence, and the effects of drift, migration and recombination on pathogen populations. His work has major implications for the role of pathogens in plant populations and plant community dynamics, the conservation of plant genetic resources, weed management and disease control in agriculture. He has served on the editorial boards of the Australian Journal of Botany, 1987-92; Euphytica, 1987-99 and Ecology Letters, 1999-2002. He is currently a member of the editorial boards of Oecologia since 1990 and the Journal of Ecology since 2003. Dr Jeremy Burdon: researcher in plant-microbe interactions.